Nakhon Phanom (นครพนม) is a city in Isaan (Northeast Thailand), and the capital city of the Province of this name. Nakhon Phanom is in the northeastern region of Thailand, approximately 734 km northeast of Bangkok and 378 km southwest of Hanoi, Vietnam. It borders Laos on the Khamoun Province or the Tha Khaek district. Nakhon Phanom was prominent during the Vietnam War, serving U.S. forces of the 56th Air Commando Wing stationed at Nakhon Phanom Royal Thai Air Force Base. Their missions were search and rescue and interdiction of the Ho Chi Minh trail in Laos 48 km to the east. The city has a beautiful landscape, with the Mekong River running adjacent to the city, marking the current border between Thailand and Laos. The population of Nakhon Phanom is a diverse mix of Thais, Thai-Vietnamese, Thai-Chinese, and perhaps a few Thai-Indians. The main languages spoken are Thai, Isaan, and Vietnamese, Isaan being the most popular of them. The primary culture is Lao, as Isaan was part of Laos until the late 19th century. Ho Chi Minh resided in a small village between the city center and the air base to the west during the late 1920s and early 1930s. A new museum has been constructed; his home is preserved and is open to the public, which draws many Vietnamese tourists. 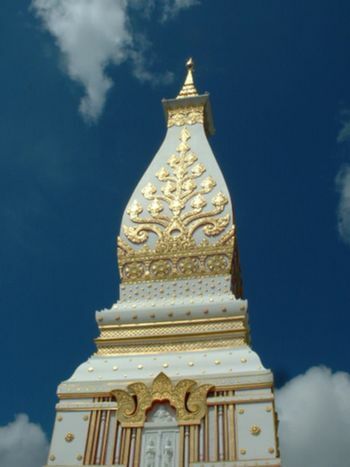 Although a small city, Nakhon Phanom is famous for its centuries-old temples and beautiful landscape. The city has a reserved and traditional Isaan culture. A traveller may well find the residents of the city very hospitable and kind. Apparently, the main reason for the strong Vietnamese influence is that Vietnamese fled here during the struggle against the colonial French. Most of them returned to Vietnam in 1960, but left a legacy in the city. The clocktower in the main road near the river comes from their influence, and signs at the local police station and hospital, etc., are written in Thai, English, and Vietnamese. There is also Vietnamese food in local restaurants. Nok Air  operates flights to Nakhon Phanom. Air Asia  also flies to Nakhon Phanom. Since the opening of the bridge it is no longer possible to cross by boat. Friendship Bridge III between Thailand and Laos is now open. It is around 10 kilometres north of town and the Thai-Laos International bus runs between Nakhon Phanom bus station and Thakhek from 7.30am to 4.30pm daily (approximately every hour). It is not possible to cross the bridge by foot. Nakhon Phanom has no rail service. The closest station is about four hours away, in Ubon, Udon, or Nong Khai. Two of the most common ways of getting to Nakhon Phanom from Bangkok are by road in private tour buses or by government-operated tour buses. These buses start from the central North and Northeastern Bus Terminal (Moh Chit) in Bangkok. The fare for bus travel ranges from 300 to 850 baht, depending on the type of bus. A more convenient and popular bus is operated by the Transport Authority of Thailand. These VIP air conditioned buses operate under the label 99 or 999. These buses are 24-seaters, with seats as comfortable as seats in the business class of an airplane. A toilet is also available inside the bus. The distance between Nakhon Phanom and Bangkok is approximately 740 km. This is about an 11 hr journey. Although it seems long, a bus travelling out of Moh Chit at 19:15 arrives at Nakhon Phanom around 06:30. Buses leaving from Nakhon Phanom to Bangkok at 18:00 arrive at around 05:30. The bus station itself is not that far from the city centre - about 1.5 km. There are tuk-tuks at the bus station. The most convenient way to get around the city are the famous three-wheelers of the northeast, more commonly referred to as "Sky Lab" (tuktuks). There are also buses and vans running to other provinces throughout the day, easily accessible from the central bus terminal or in front of the local market. Songteows are available to get to neighboring towns. Songteows headed south go to Na Gae (yellow), That Phanom (yellow), Chok Amnuay (yellow) and Pla Pak (orange-red). These vehicles originate on the street of the fresh market, about halfway between the fresh market and the south end of the street. near the K-Bank. They run during daylight hours. Songteows to Pla Pak and Chok Amnuay have posted times, but the others do not. Tourists looking to escape more crowded and busy tourist locations in the country or who just need a getaway from the hustle and bustle of city life often travel to Nakhon Phanom to relax and see the more local and traditional Thai culture and way of life. Temples are the most frequented attractions, especially the Phra That Phanom Temple located in Amphoe (District) That Phanom of Nakhon Phanom Province, 53 km from Nakhon Phanom city center. Nowadays, with only as short commute between Thailand, Laos, and Vietnam, many tourist travel through Nakhon Phanom and Laos to Vietnam. It is approximately a 5 hour journey to get into Vietnam from Nakhon Phanom. Many local travel agents can arrange group visits to the many attractions in Laos and Vietnam. Also with the business in Vietnam growing at ground breaking pace, many business travellers also travel through Nakhon Phanom into Vietnam for business trips, or to seek and learn about more business opportunities. Travel to Tha Khaek across the Mekong into central Laos following Route 12 has recently become popular both for those seeing to visit the new jungle preserves created by the Democratic People's Republic of Laos as well as visit the location of the famous Ho Chi Minh Trail. Visa entry is now possible on the ferry between the two cities. Ho Chi Minh House. This is where Ho Chi Minh lived from 1924(?) to 1931. It is in Ban Nachok, which is on the Nakhon Phanom to Sakhon Nakhon road at Km 237/238. To get there might be difficult if you cannot find a Thai person who speaks reasonable English. Old Governor's Mansion. Contains a wide array of historical photographs, including topics such as the fire boats and royal visits to the province. Descriptions are primarily in Thai, often accompanied by limited English translations. Also contained in the building is an English language lending library, open to the public. The library was established by the volunteer teachers from WorldTeach 2009-10, and continues to grow with new contributions. Fire Boats Festival. Communities from the province build large scaffolding out of bamboo, which they put on boats and float down the river in the annual fire boat festival. Tin cans are filled with kerosene and stuffed with rags are then arranged on the scaffolding to form images of temples, the king, dragons. At night the boats float down the Mekong River for the appreciation of spectators. Held one night a year, at the end of Buddhist Lent, as determined by the lunar calendar, and usually falls sometime in the month of October. The festival culminates in the floating of the Fire Boats, but a larger festival goes on for a week preceding the end of Buddhist Lent. Other activities include markets all along the river road, long boat races, and an elephant or two. That Phanom Festival. In February of each year, a 10-day festival is hosted in That Phanom that attracts people from all over the country and from other countries as well. Due to the proximity to That Phanom, Nakhon Phanom can make a good home base to enjoy this festival. Nakhon Phanom is famous for its silk fabric and silver ornaments. However, most of the silk pattern and manufacturing is accomplished on handmade looms in the local villages in traditional Lao style, known as Isaan today within Thailand. The silver is manufactured and crafted both within Isaan and Laos. Nakhon Phanom has some of the best sticky rice and grilled chicken with papaya salad in the country. There are not too many restaurants open in the centre of town at night. A couple may be found along Bamrungmueng Rd, to the left as you face the direction of the river. Menus are totally in Thai, and English is not spoken. If you are stuck for a meal, order "Pat Pak Ruam" (fried mixed vegetables), and add the word "Guy" (for chicken), "Moo" (for pork), or "Gung" (for prawns). Also ask for "Cow Soo-eye" (steamed rice.) Will give you a tasty and filling feed for around 100 baht, including a large bottle of beer. Snack type stalls are also available from about 16:00 on Fuangnakom St, which is at right angles to the above road. It is an afternoon/night market,and the road is closed off for the duration. You can buy fried insect snacks if this is to your taste. This page was last edited on 12 December 2016, at 12:09.